Credit to Anemistyle for this beautiful creation, which has quite easily changed my culinary life :) I was spoilt rotten when I had lunch at hers this past week. You can check out pictures of the vegan dishes she rustled up on my Facebook page. 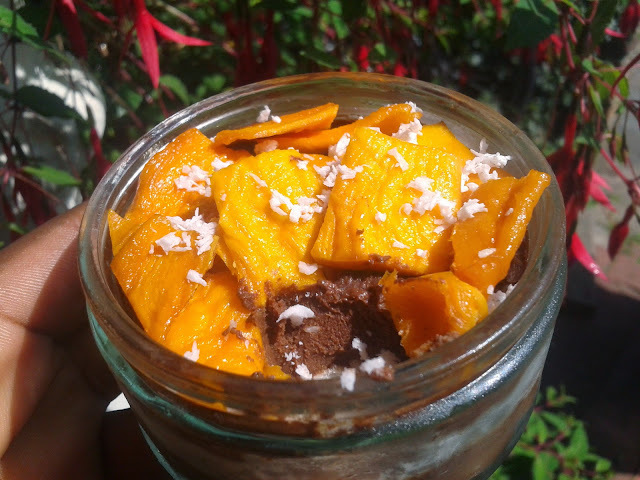 One of the desserts she made was the very delectable 'bounty in a cup' which was assembled with creamy, home-made, vegan chocolate mousse and a soft coconut layer in the middle. The chocolate bar 'Bounty' used to be one of my favourites in my pre-vegan days and so I didn't even need to taste the dessert to fall head over heels in love with it. I was blown away by the texture of the mousse, and was unable to guess the secret ingredient to getting it so smooth and creamy. You probably won't be able to guess either, but you will be delighted with the results - trust me! The ingredients are easy to find and are all indigenous to Nigeria, so I hope to hear some feedback from a lot of you who try it at home! A dose of spontaneity is always good for the soul so when lunch was over, we ventured to the nearby grocery store to pick up some ingredients to experiment a bit more with the chocolate mousse. The experiment involved flavouring some of the mousse with a touch of chilli, and topping with a range of fruits to see what worked and what didn't. Three tropical fruits were selected for the task - mango, banana, and orange. I will be reviewing the mango and banana. Dried mango - this was probably my favourite combination. The mousse for this pot didn't have any chilli added, which I think was for the best as it would have overwhelmed the flavour of the mango. The mango added some extra sweetness and a chewiness to every bite - a welcome contrast to the creamy mousse and slightly crunchy coconut. It would be worth experimenting with some fresh mango to see if that works as well. If any of you do use fresh mango, let me know what you think. Banana - the mousse used for this pot was flavoured with chilli. I overdid the chilli in this one, and have adjusted the recipe below. It was wayyy too hot, even for a spice enthusiast like myself. Chilli-chocolate is a wonderful combination when the balance is right, so go easy if you decide to add some. As for using fresh banana as a topping, you can't go wrong with that. I plan to re-make this soon using the amended recipe. To make the chocolate mousse, blend the avocados in a food processor or mash it by hand with a wooden spoon until smooth. Add the cocoa powder, 4-5 tsp sugar, pinch of salt, vanilla essence and optional chilli powder. Mix well to combine all the ingredients. To make the coconut layer, place the grated/dessicated coconut in a bowl, add the water and 1 tsp sugar. Combine to form a soft coconut paste. To assemble the dessert, start by layering some mousse at the bottom of a small glass cup or ramekin, making sure to smooth out the top with the back of a spoon. Next, add a generous layer of the coconut mixture. 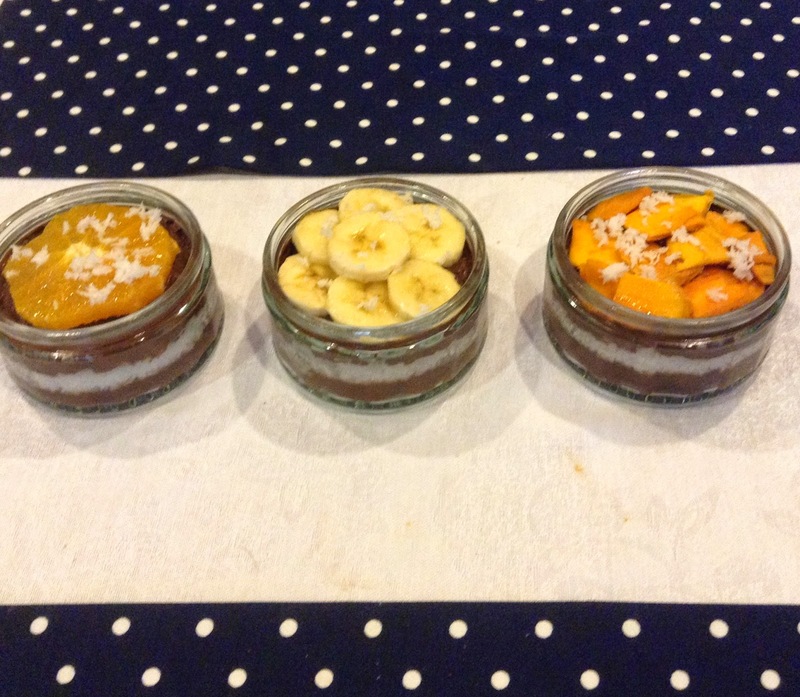 Finish off with another layer of chocolate mousse, smooth it out, and top with some slices of fresh fruit. Sprinkle on any leftover coconut to garnish. Refrigerate for at least a couple of hours or until you are ready to serve them. It should keep for up to two days. We also scooped some into tiny cupcake cases and topped them with different things: banana, coconut and mango, cashew nuts. Bite-size portions that can be frozen for a melt-in-the-mouth treat. Looks soo good can't wait to try this, can't believe it us avocado. Couldn't believe it either..it's so delicious! *proceeds to unfollow you and Nemi!!! * THIS IS SO UNFAIR!